Step 1 In a blender, combine the acai powder, blackberries, yogurt, pomegranate juice, almond butter and maple syrup. Blend until smooth but not too liquid. You may need to stop once or twice to move things around with a spatula. Step 2 Pour into bowls and sprinkle with toppings. 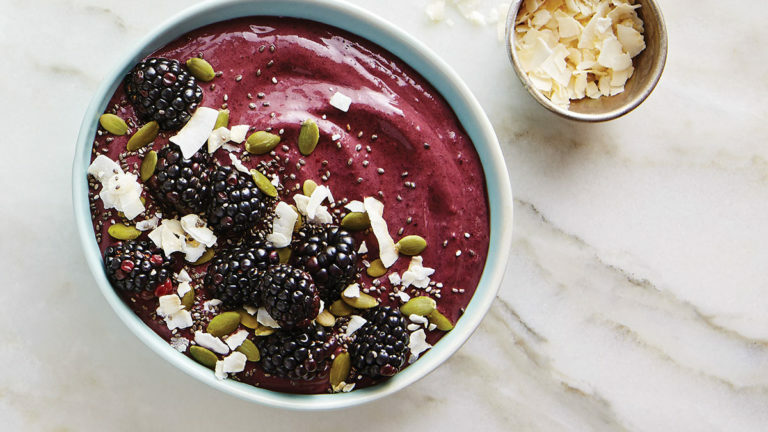 Jam packed with antioxidants, there's no better way to start the day than with this nutritious and berry-licious smoothie bowl.